Wow. I hit a wall last night. This happens from time to time; I mean, there is the usual 'end of a long day' tired that it would be irrational not to expect, given my too-early alarm and refusal/inability to get to bed at an hour that makes sense given said alarm. If I want eight hours, I have to be in bed by 7:30. So generally, I'm going on between four and six hours of shut-eye. Which means that I'm prone to a unique form of lethargy in the early evening. Yeah. I was in bed shortly after 8:00. And I think I'd actually been asleep for a good hour and a half by then. BUT, on the plus side, I feel sooooo much better this morning! 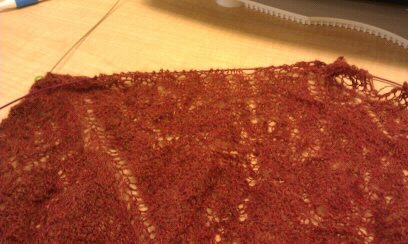 And, I'm almost halfway through the knitted on border of the shawl! Hey, sleep is a necessity! And I'm glad you finally got a little rest. Even the Energizer Bunny needs to recharge once in a while! There is nothing better than a good night sleep in a comfy bed. It's my number one luxury item. Given your crazy schedule, I do wonder when you get the time to just sit back and enjoy the roses. No wonder you crashed out. You're up at 3.30am, out of the door in an hour, at work before 7 back on the train by 4pm and into "mommy mode" by 6! My dad used to do similar hours (he got up at 4.30am to get to work before 7) and I remember him being sound asleep before 9 most evenings.